Oil demand will grow steadily in 2019 thanks to a solid global economy, but the world may face a large supply gap by late next year if Opec cannot cover any supply shortfalls, the International Energy Agency said. 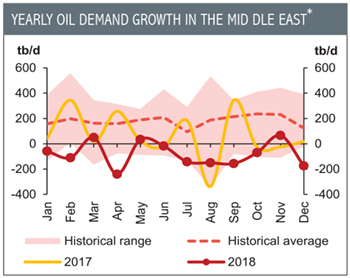 The IEA said it expects global oil demand to grow by 1.4 million barrels per day (mbpd) in 2019, to top 100 mbpd by the second quarter of the year. The agency expects demand to grow at the same rate this year, unchanged from its last report in May. The oil price has risen by a third to around $76 a barrel, close to its highest since late 2014, since Opec and other producers including Russia began cutting production in January 2017 by 1.8 mbpd. "Increasing trade tensions are the main risk to our oil demand forecast," the IEA said. Canada and the European Union have announced plans to increase tariffs on selected US goods in response to US duties on steel and aluminium imports. "The risks associated with escalating retaliations are not negligible ... A prolonged slowdown in trade would negatively affect world GDP growth and oil demand, as a significant part of oil consumption is linked to trade activities." The Organization of the Petroleum Exporting Countries meets on June 22/23 to discuss its supply policy, particularly in light of protracted declines in Venezuela and the prospect of new US sanctions on Iran later this year. "Even if the Iran/Venezuela supply gap is plugged, the market will be finely balanced next year, and vulnerable to prices rising higher in the event of further disruption. It is possible that the very small number of countries with spare capacity beyond what can be activated quickly will have to go the extra mile," the agency said. 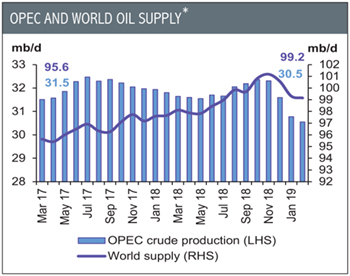 "If the other 12 Opec members were to continue pumping at the same rate as May, a potential supply gap could emerge and lead to a draw on stocks of more than 1.6 mbpd in the fourth quarter of 2019," the report said. The agency said it had looked at a scenario in which by the end of next year output from Iran and Venezuela could be 1.5 mbpd lower than it is today. The IEA estimated that Iranian exports would drop by the same amount as they did during the last round of sanctions. For Venezuela, the agency said it saw no respite in the collapse in production from economic crisis that has taken 1 mbpd off the market in the past two years.